Lindo Lake Park in Lakeside has become a hotspot for wildlife photographers. This year’s rains brought enough water to fill the east basin, bringing with it again an abundance of wildlife. Many shore birds have migrated here to take advantage of an abundance of food and ideal nesting along the shallow shorelines. Stilts, avocets, great blue herons, great egrets, killdeer, and more are among the waterfowl that cohabitate at Lindo Lake. For the photographer, the many birds that nest and forage along the shores make a good subject to photograph. Recently however, one critter has stolen the show. He is long and sleek, quick and sure-footed, able to duck for cover in the blink of an eye, and then stand tall in the grass. Photographers have come to photograph these playful long-tailed weasels who enjoy a game of chase, diving from one hole to another, darting back and forth as if playing tag. Though the weasels spend most of their time playing and chasing each other, don’t let that fool you: they are skilled hunters. Their primary food source is gopher. They will also raid bird nests on the ground, other rodents, bugs, and, in some cases, rabbits. No one is sure how long the weasels have been at the park. My guess would be they have been here all along, just no one has noticed till now. 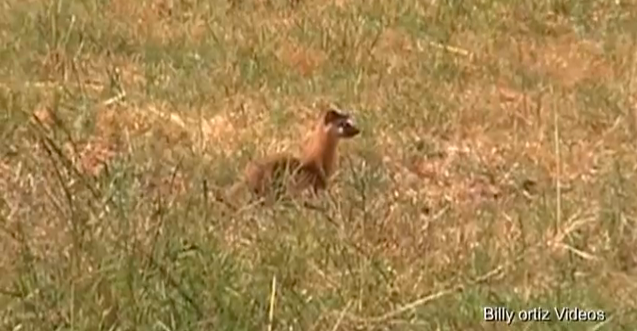 The best time to weasel watch is early to mid morning and late afternoon to dusk. You can find the weasels at the far east end of Lindo Park, on the corner of Petite Lane and Lakeshore Drive.